Its been 5 years this month since we started this blog so I thought it was time, for your sake and mine, that I define exactly what it is that we are trying to do here. The chosen subject of this blog is Innovation period of surfboard design that we define as 1975 to 1985. The aim to to explore, re-discover and learn about the surfboard designs, the shapers, their theriories of how and why their surfboards work or don't work. At the same time learn more about the surfers who rode them at the time. We do this by finding, restoring and test riding, measuring and photographing surfboards from this period for the purpose of sharing the findings. The ultmate aim, is to uncover and highlight a design feature or surfboard shape that was over looked by history and bring it to light so as it my be re-discovered and apreciated today and ultimatley give credit where credit is due to the original designer shaper. After the excitement of the initial short board revolution 1968 thru '72 surfboard design went through a relativley conservative phase. The innovation period, or T2 the second transition period, saw an explosion of new designs ideas and concepts. These new found ideas were fueled by what was happening else where in pop culture in the late 70's and early 80's, music, art and fashion. Some of these new surfboard designs exploded onto the sence, were imediatlley embraced and thrived due to a combination of factors both political, fashionable and functional, others due to poor timing and the zeigeist of the time, withered and died on the vine. 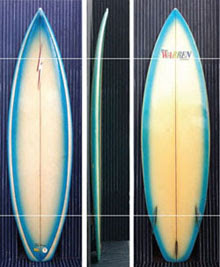 After about 1983 surfboard design went into another, longer, more conservative phase, as the no nose template and three fin thruster design took hold. This is not meant to be a vanity project, its about sharing. Its not about me and my collection or, god forbid, my surfing. To share my stories I've got to put myself out there. It is the journey of discovery through a certain chapter of surfboard design history seen through the eyes of one passionate and enthusiastic industrial designer and dedicated but average surfer. I want to share my impressions of how a design does or dosent work by taking it for a surf and writing about it. If I can illustrate my test rides with photos I will. But remember we are looking at and judging the board not the surfer. 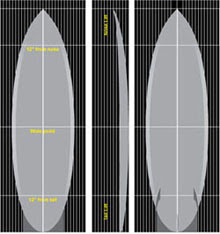 I try to find a surfboard design to feature that I know nothing about. I use that as a starting point for the mission. By definition then, I often know nothing about a particular board when I first feature it. Thats the point, its a journey of discovery. Often the best insights come from readers feedback, comments and contributions. 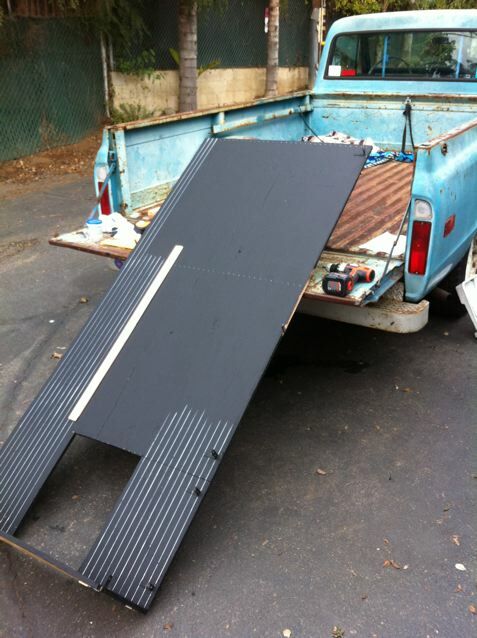 I am constantly on the look out for old boards. 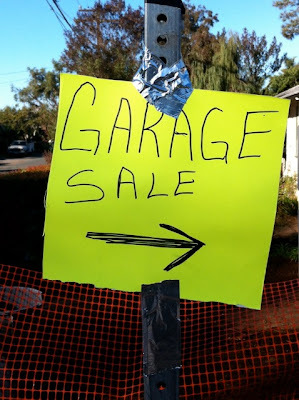 I find boards in yard sales, thrift stores, hard rubish throw outs, swap meets, the back room of surf shops, on gumtree, craigslist and eBay. Many of my best finds have come through tips from readers of this blog and for that I'm deeply grateful. Once I find a board I know little about I start digging through my collection of vintage surfing magazines. 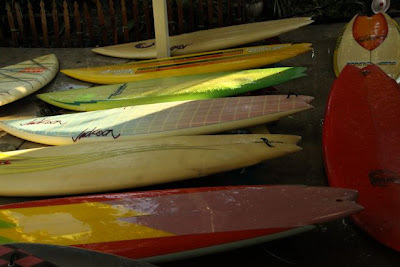 These include Surfer (US), Surfing (US), Tracks (AU) Surfing World (AU), Waves (AU), Australian Surfing life (AU) Breakout (US) amoung others from 1975 to 1985. I'll scan or photograph relevant ads, photos and editorials. I only ever use the internet as a last resort. My aim is to use as many original photos as possible. 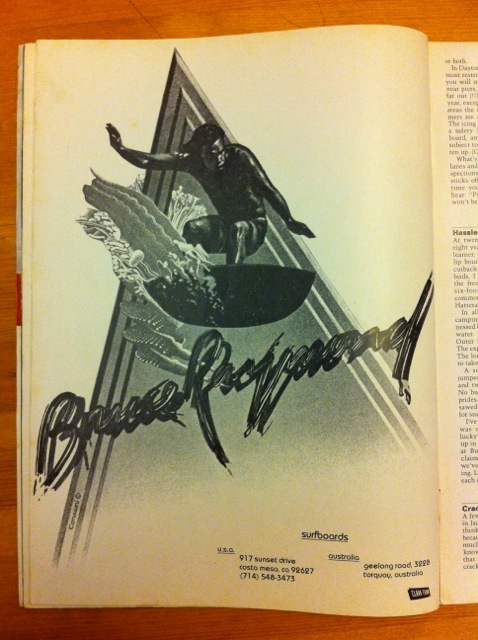 This includes scans I do from my vintage surfing magazines. This means most of my photos are of questionable quality. My aim is to plunder and recycle from the internet as little as possible. Where I use someone elses image I try to give credit. Since my recent aquisition of a waterproof camera I will endevor to do as many on board, in action water photos as I can. My mission is to try to give as accurate measurements and descriptions of the design features of the surfboards as possible. As possible means, when I find enough time. To date I have not yet once achevied this aim. So I refer to my freinds at surfresearch.com.au to show an example how it shoud be done. DESCRIPTION: 1978 Mark Richards Twin fin II 5 ft 10"
MANUFACTURER: Maddog Surfboards, Byron Bay. Length (bottom) : 5' 11"
Width at wide point : 19 3/4"
Nose (width 12" from nose) : 14 1/4"
Tail (width 12" from tail) : 14 1/2"
FINS: 6" x 5" base x 7'' span @ 10 1/2'' Brewer, inside flat/outside foiled, toed and tipped/cambered. Its true, to date I have not completely fulfiled the aims set out above. But I hope we can all enjoy the next 5 years of trying.